We track real-time data on nearly 20,000 Facebook business pages at Rival IQ, and I used this data set to determine several best practices for Facebook engagement. This is not a random sample. Most of these pages we track are based on requests from RivalIQ users, but almost all major brands are represented. What Does “Good” Mean on Facebook? Observation #1: News sites seem to be the dominant category with strong showing by Retail, Outdoor Recreation/Sports, and Fashion. Observation #2: Virtually all of the top 100 pages ranked this way were what I would call B2C sites. Only a couple (Boom Social by Kim Garst and Volunteer Spot) would be targeting businesses vs. consumers. Observation #3: The really big brands don’t seem to float to the top. There wasn’t a single top brand in the top list. The most recognizable included Billboard.com, USPS (likely promoted-see below), and several news outlets such as Huffington Post, Hello! Magazine, etc. So what works on Facebook? The number one overall page was “ICICI Prudential Life Insurance” – say what?? I hadn’t heard of them, have you? Turns out as I’ve written about before on Convince and Convert contests can really jack up engagement and this is an example of this phenomenon. 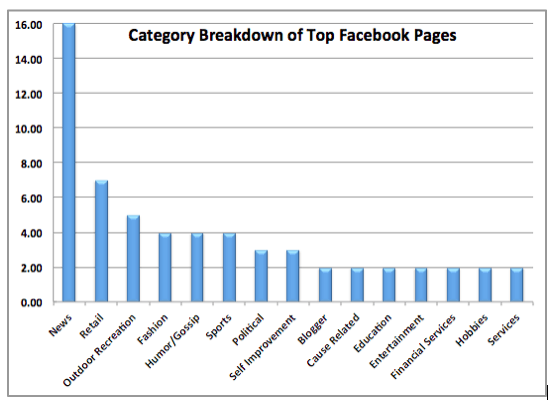 Observation #4: Contests can drive significant engagement on Facebook. Other FB Pages in the top 10 and what we can learn. Ask for the share/like sometimes. We’ve probably all heard it, when you ask for the RT or Like, it happens more often. It is easy to overdo this but PetFlow demonstrates that it can be effective – or at least in combo with a cute pet photo. While Facebook doesn’t tell you if something has been promoted, clues can include an off-balance like-to-fan ratio with no clear indication that the post went viral as indicated by lots of shares. A weakness of looking at Average Engagement Rate per Day is that someone who posts A LOT can accumulate lots of small engagement numbers that roll up into a big number. Inked Magazine, Petflow, and several news organizations are examples of the phenomenon of posting 40+ times per day vs. Ziglars 4.5 per day. My own takeaway here is to evaluate sorting by engagement per post vs. per day. Observation #10: Promoted posts can work. A frequent customer request we get at Rival IQ is whether we can tell if a post (by a competitor) has been promoted on FB or Twitter. While you can see organic vs. promoted activity for your own Facebook page via Insights, neither Facebook or Twitter exposes publicly if a post has been promoted. But, there are public data points that strongly suggest a post has been promoted, such as a very high ratio of post likes compared to overall page likes. I was surprised when this popped up on the list and a little more digging shows that there is a series of videos on retirement and saving that Principal Financial Group rolled out recently. These were likely promoted. Another one… was this post from USPS promoted? This is a little less clear but looks like it. Once you look a bit closer at all the top posts by USPS and how much engagement they have gotten it looks like this is a coordinated campaign. Observation #11: Sometimes just plain cool works. Observation #12: Quotes are working very well right now. Several B2B FB pages like Kim Garst’s Boom! Social leverage inspirational quotes very effectively. I could keep going for quite a while but I’m going to stop for now. If you are interested in digging into this collection of top companies like I did you can make a copy of this landscape in Rival IQ for free right here. I would love to hear what insights you find so please share with me in the comments. Ask for the share/like sometimes, be careful to not over do it but it doesn’t hurt to ask. While not published it does appear you can identify posts that were likely to have been promoted. John Clark is the Founder/CEO of Seattle based, Rival IQ. The company provides an easy to use competitive analysis solution for online marketers. Improve your own marketing by learning from others.